Mycologist Philip Ross is seriously into mushrooms, but not as a food -- instead, he uses fungi as a building material. Beneath the surface of the ground, fungi form a wide network of thin, rootlike fibers called mycelium. That part of the fungus isn't particularly tasty, but Ross discovered that when dried, it can be used to form a super-strong, water-, mold- and fire-resistant building material. The dried mycelium can be grown and formed into just about any shape, and it has a remarkable consistency that makes it stronger, pound for pound, than concrete. The 100% organic and compostable material has even piqued the interest of NYC's MoMa PS1, where the award-winning Hy-Fi Mushroom Tower pavilion is currently being built. We first discovered Ross’ unique mycelium material at The Workshop Residence in San Francisco’s Dogpatch neighborhood during the 2012 AIA SF‘s month-long Architecture and the City festival. There, Ross is erecting a small laboratory in which he will grow mushrooms that will be used to produce a series of chairs and stools. “I want to demonstrate how you can create this kind of fabrication using local agricultural waste,” Ross told Food Republic regarding his Workshop Residence furniture. The lab was still under construction when we visited, but some of Ross’ completed works were on display. The exciting thing about mycelium is that it can be used to build virtually anything. In many of Ross’ creations he grows the fungus into a brick, which becomes super hard and surprisingly lightweight once it dries. 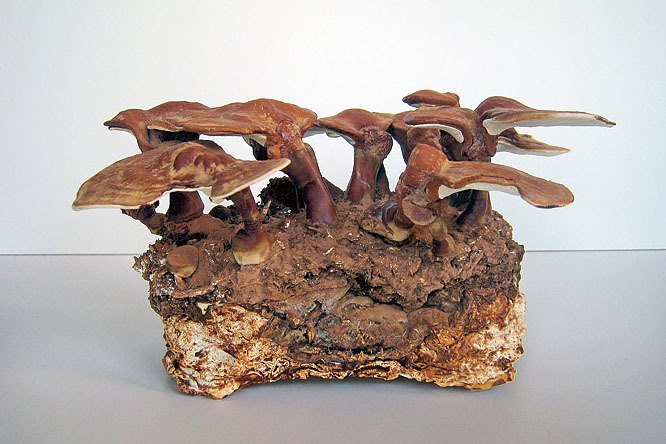 For example, in Mycotecture, one of his most ambitious structures, Ross grew the fungus Ganoderma lucidum (or Reishi) into bricks at the Far West Fungi mushroom farm in Monterey, California, and stacked them into an arch. A variety of different lacquers and finishes can also be applied to the outer layer of the bricks to seal them and give them a glossy finish. Ross also recently patented his own version of the mycotecture procedure; Evocative, the biomaterials firm behind NYC’s Hy-Fi Mushroom Tower, has also been awarded a patent for a similar procedure. Ross isn’t just interested in mycelium’s potential as a building material, though — he also uses it as a medium for fine art. His work has been on display at several at museums around the world, and he regularly debuts his other biomaterials works at events such as Maker Faire. Can you build load bearing walls and foundations with this? This is so amazing are the dried bricks water proof? This is wonderful. I would love to see it used on a larger scale. Hu hom, this may seem like a nice idea, but how long will the mycelium hold, before it degrades? how do you stop it from growing new funghi when wet? how do you prevent it from falling apart when wet? howis the energy input output balance? seems to me at the moment like a very basic building material that needs a lot more study before it can be used commercially. What's the cost for mycotecture materials compared to other typical building materials? Is it easy to source large amounts of it? If it\\\'s light, it might also have insulative prperties. I'm the only one weird enough to ask this, what's the heat range for application and thermal expansion and degradation timeline. Wonderful idea. When does Mr. Toss receive visitors? We discovered Ross' unique mycelium material at The Workshop Residence in San Francisco's Dogpatch neighborhood during AIA SF's month-long Architecture and the Cityfestival. "I want to demonstrate how you can create this kind of fabrication using local agricultural waste," Ross told Food Republic regarding his Workshop Residence furniture. A variety of different lacquers and finishes can also be applied to the outer layer of the brick to seal it and give it a glossy finish. The exciting thing about mycelium is that it can be used to build virtually anything. At the Workshop Residence Ross is erecting a small laboratory in which he will grow mushrooms that will be used to produce a series of chairs and stools. The lab was still under construction when we visited, but some of Ross' completed works were on display. In many of Ross' creations he grows the fungus into a brick, which becomes super hard and surprisingly lightweight once it dries. "It has the potential to be a substitute for many petroleum-based plastics. It’s left the art world and seems to have entered a Science Fiction novel or something like that," explained Ross in a recent interview with Glasstire. In 2011, Ross applied for a patent for the use of mycelium as an organic building material (the patent is still pending). Ross isn't just interested in mycelium's potential as a building material, though -- he also uses it as a medium for fine art. His work has been on display at several at museums around the world, and his work is currently part of the “Intimate Science” exhibition, which opens at Real Art Ways in Hartford Connecticut in November. The fungus can be trained to grow in almost any shape imaginable. In Mycotecture, one of his most ambitious structures, Ross grew the fungus Ganoderma lucidum (or Reishi) into bricks at the Far West Fungi mushroom farm in Monterey, California, and stacked them into an arch. These structures were exhibited at the Kunsthalle Düsseldorf as part of the 2009 Eat Art exhibit. This structure was grown from the fungus Ganoderma lucidum. Mushroom bricks stacked atop one another. Tiny mushrooms sprout from the organic, compostable building material. 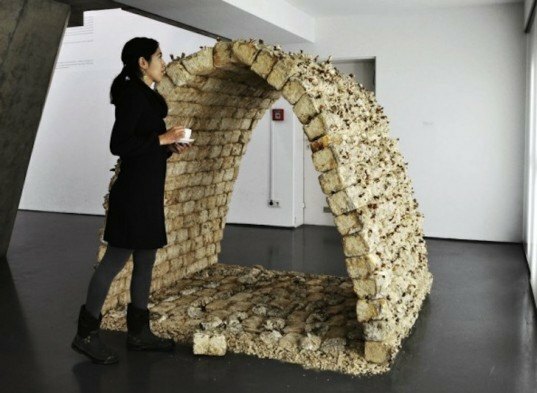 These mushroom bricks can even be built into the shape of arches. The structure is held together using chopsticks. 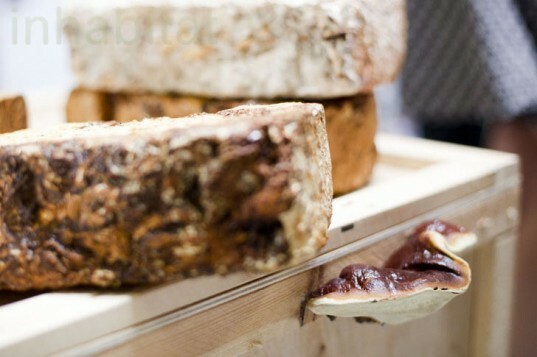 The mushroom bricks are also edible, although they might not taste very good.